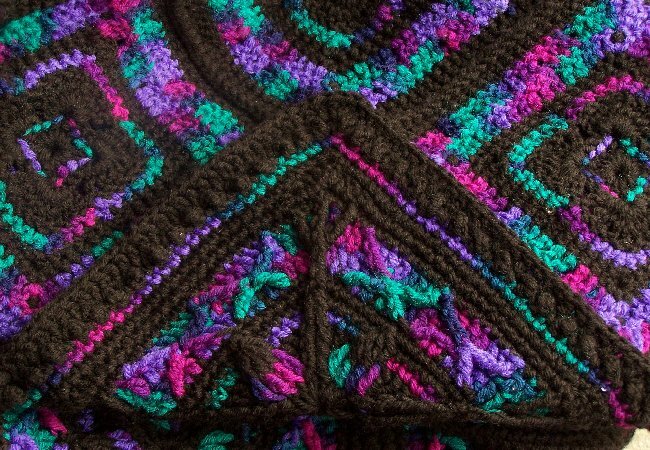 Congratulations to Stephanie V. who is the winner of my handmade Stained Glass Afghan! If I do not hear from Stephanie in by Tuesday, I will announce a runner-up winner. Bloggy Giveaways is hosting a Carnival this week of what else . . . . Giveaways! Giveaways all over the Blogosphere! So, since I've been doing a few giveaways here, I decided to join in and cap off the month with a big one! 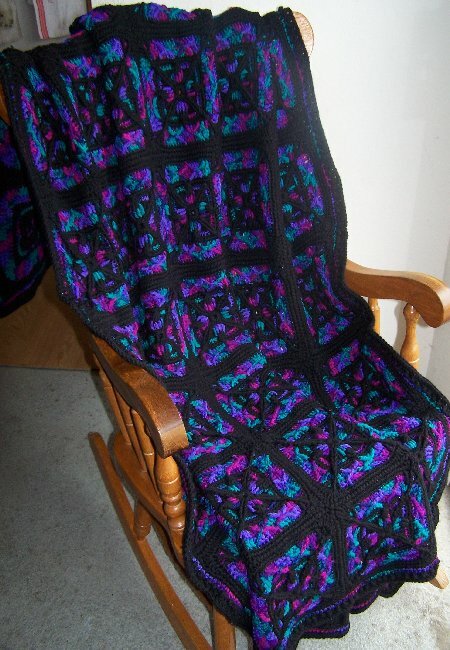 This afghan, handmade by me, is varigated Purple, Teal, Pink/Magenta and bordered with black. The stitch is very textured, as I hope you can see in the photos. And it has a simple bobbled edging. (Underneath the corner is the smooth back of the afghan.) This afghan measures approximately 58"x76". 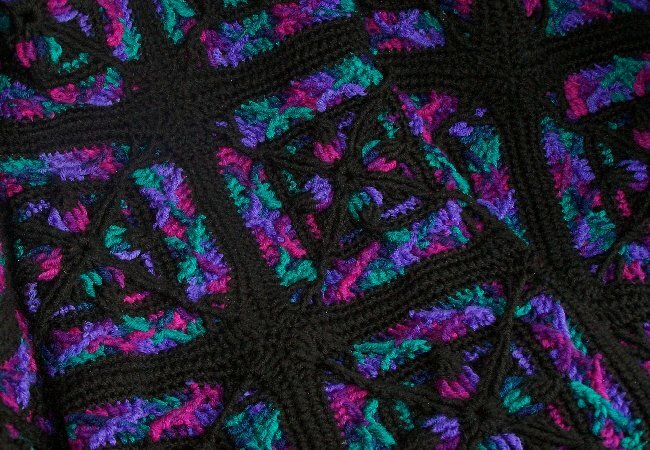 If you'd like to be the winner of this stunning Stained Glass Afghan, then please leave a comment before 6:00 a.m. (PST) on Sunday, February 3rd. The winner (maybe YOU!!) will be announced before 12:00 noon. Edited to add: Due a surprise from my husband, the winner will be announced by 6:00 p.m. Sunday evening. HERE is my other Bloggy Giveaway, happening now - Take a look! Click HERE to see all of the other great things you can enter to win! . . . . . . Connie at Smockity Frocks ! 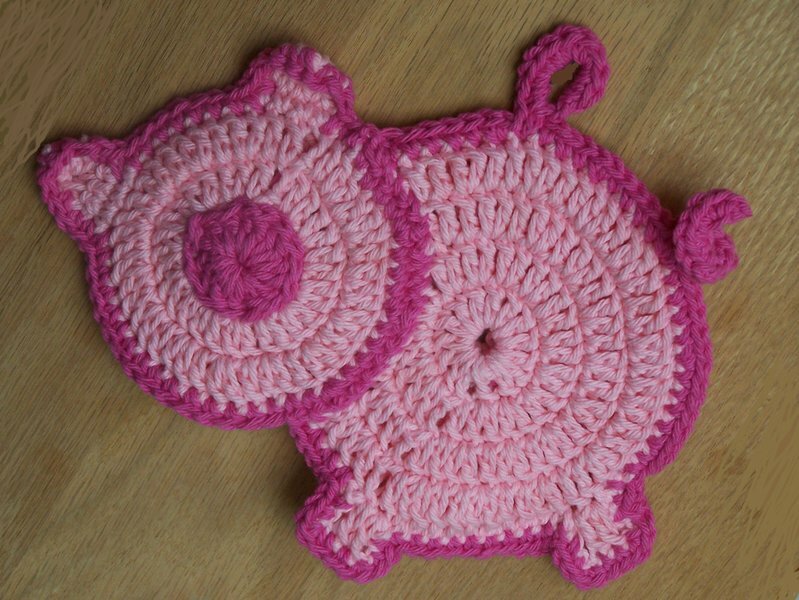 Congratulations Connie on winning the "Pigling" potholders! . . . . Elise at A Path Made Straight! Congratulations Elise on winning the set of 8 Pleasant Words note cards with envelopes! 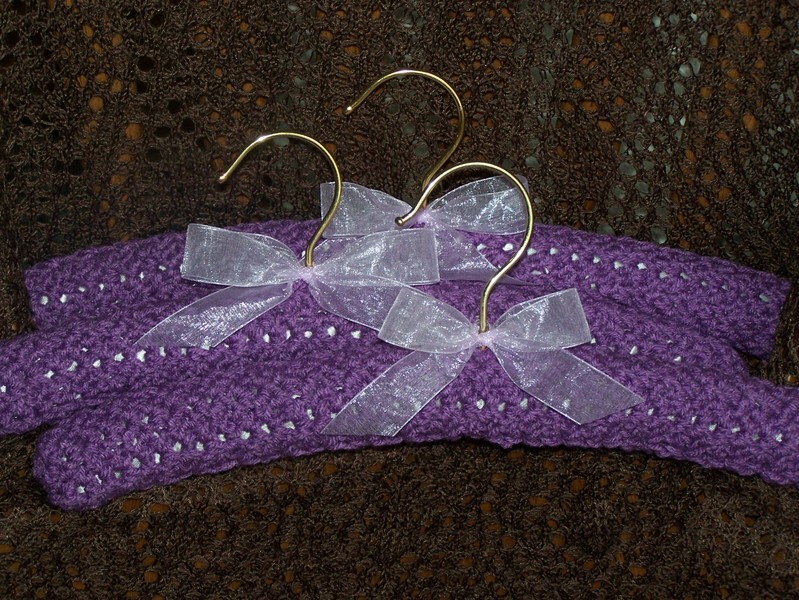 The third birthday giveaway I am offering is for a set of three crocheted covered hangers, done in a soft purple yarn and tied with a lavendar sheer taffeta ribbon. These are wonderful to use not only for sweaters but for blouses, lingerie, or any light clothing that has a tendency to slip off of regular hangers, besides just being a very pretty and feminine addition to your closet! Hangers are approximately 15" long. RULES: Leave a comment to enter this giveaway. Want to be entered a second time? Just refer a friend and have them mention your name in their comment! Deadline for entries is Friday, January 25, 6:00 a.m. Pacific Standard Time. All entries will be placed in our favorite bowl and the winner drawn and announced before 12 Noon on January 25th. Have an elegant day and be looking for the next giveaway in a few days! AND be sure to look at the other giveaways currently happening! It's Wednesday so it must be time for our next giveaway! This one is for a pair of Piggy Potholders that are -of course- pink with hot pink edging! Handmade from Sugar & Cream cotton yarn, double-thick and cute, too! Do you see his (or her?) little curly tail? A bright and fun addition to your kitchen! RULES: Leave a comment and name the Piggy to enter this giveaway. If you'd like to be entered a second time, just mention the Piggy on your blog (be sure to send me a link so I can see it to!). Deadline for entries is Wednesday, January 23, 6:00 a.m. Pacific Standard Time. All entries will be placed in our favorite bowl and the winner drawn and announced before 12 Noon on January 23rd. Have a Pink day and be looking for the next giveaway in a few days! AND be sure to look at the other giveaways currently happening! So, to start off the month-long celebration here, the first giveaway will be a set of 8 notecards with coordinating envelopes, handmade by me. 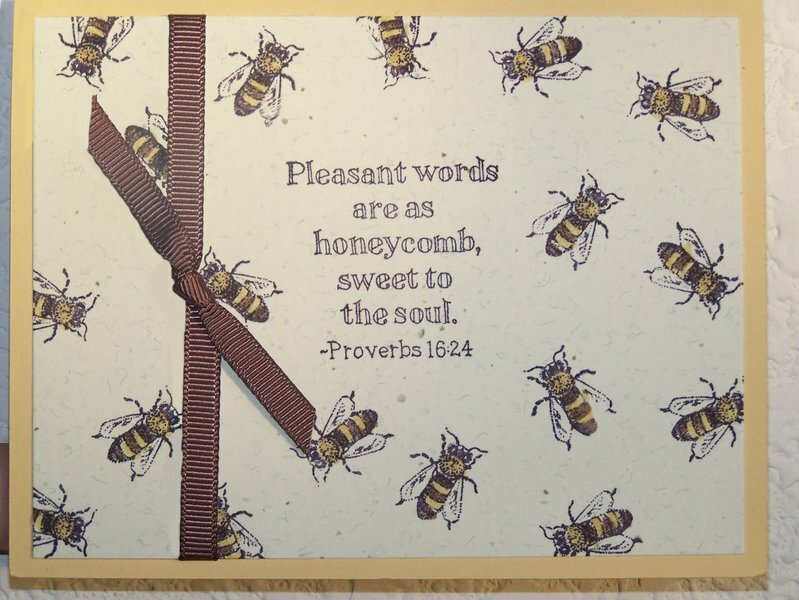 These are all-purpose scripture notecards; the verse and bees are stamped on beige confetti cardstock, which is mounted on So Saffron - a warm, soft golden color - and tied with a Chocolate Chip grosgrain ribbon. The bees are also handcolored with Cocoa and So Saffron. Cards will be in a clear card box for safe shipping and storage. Okay - RULES: Leave a comment and tell me how you got here (how you found Hen and Chicks) to enter this giveaway. If you'd like to be entered a second time, then please tell me about a favorite post you've read here. Deadline for entries is Monday, January 21, 6:00 a.m. Pacific Standard Time. All entries will be placed in our favorite bowl and the winner drawn and announced before 12 Noon on Monday, January 21st. Have a great day and be looking for the next giveaway in a few days!